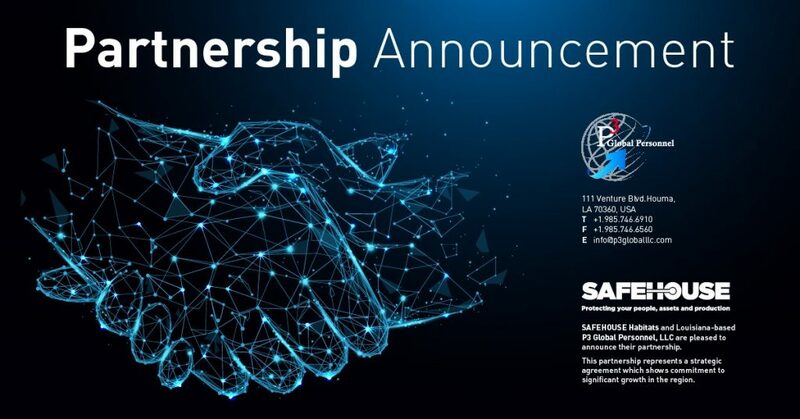 Safehouse Habitats, global leaders in the provision of engineered safety solutions to the oil and gas industry, are pleased to announce their partnership with Houma, Louisiana-based P3 Global Personnel, LLC., employers of safety-based personnel for U.S. onshore, GOM and international operations. SAFEHOUSE protect people, preserve assets and improve production through engineered protection and services to ensure work in hazardous environments is universally safe. P3 Global Personnel’s experience and presence in the area offers significant opportunity for the expansion of Safehouse’s reach within the USA. This partnership represents a strategic agreement which shows our commitment to significant growth in the region and we are excited about the prospects that this collaboration will bring.